Red White Blue Classic Slot Review - Casino Answers! 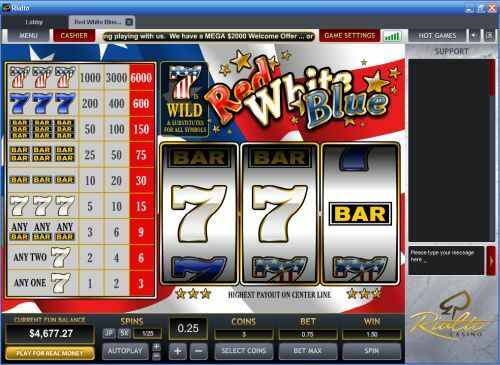 Red White Blue is a 3-reel, 1-line classic slot machine developed by Top Game, featuring a wild symbol. You can play the Red White Blue classic slot machine at Bovada. Red White Blue is a penny slot. Bets on the Red White Blue slot machine are $0.01, $0.05, $0.10, $0.25, $0.50, $1, $3 and $5. You can bet 1-3 coins per spin by pressing the “Select Coins” button. You can bet up to the maximum total bet of $15 per spin. Red White Blue has a decent betting range available for most online slots players. To play the Red White Blue slot game, select your bet and press “Spin.” To play the maximum 3-coin bet, use the “Bet Max” button to spin the reels. The top-paying symbol on the Red White Blue slot machine is the Star Spangled Seven symbol. If you hit 3 Star Spangled 7’s on the center payline, you will win the 6000 coin top jackpot. The Star Spangled Seven symbol is wild and will substitute for the other symbols on Red White Blue. You can win this top payout today by playing at Bovada! There are 9 winning combinations on the Red White Blue 1-Line classic slot machine. The complete payout schedule is as follows (1/2/3 coin payouts in parenthesis): 1 White Seven symbol (1/2/3), 2 White Seven symbols (2/4/6), any 3 Bar symbols (3/6/9), 3 White Seven symbols (5/10/15), 3 Single Bar symbols (10/20/30), 3 Double Bar symbols (25/50/75), 3 Triple Bar symbols (50/100/150), 3 Blue Seven symbols (200/400/600) and 3 Star Spangled Seven symbols (1000/3000/6000). Red White Blue has a basic autoplay mode. You can use the “5X” button to play five autoplay spins or hit the “JP” button to play until the jackpot is won. If you would rather play a specific number of automatic spins, use the “+” and “-” buttons to select up to 95 autoplay spins. To start the autoplay feature on Red White Blue, use the “Autoplay” button. You can stop Red White Blue’s autoplay mode at any time by using the “Stop” button. If you’re an American who wants to celebrate your country, then we think the Red White Blue slot machine is a great choice for you! If you’re not American, but just enjoy a good ol’ slice of Apple Pie and a healthy dose of Americana, then you too can enjoy the Red White Blue single line slot over at Bovada! Are American players allowed to play Red White Blue Slots? Yes, if you’re from the USA, you are most welcome to play the Red White Blue fruit machine at Top Game casinos like Bovada. Does Red White Blue have a progressive jackpot? There is a Stars and Stripes Progressive Jackpot at Top Game casinos, but it can only be played on the 3-Line and 5-Line versions of Red White Blue. You can also play these slots at Bovada. There is also a similar progressive jackpot slot over at Vegas Tech casinos called Red, White & Win which you can play at Bovada.